We are finally at the mid point of the split, and with only five more weeks of competitive play left, teams are reaching a point where every single win matters. An upset could mean the difference between reaching the playoffs or waiting on the sidelines until January. The meta has stabilized quite a bit, we’re seeing a lot less funneling comps over the last two weeks of competitive play, and with the patch 8.14 changes coming in a couple of weeks, we should be seeing standard team comps almost exclusively. 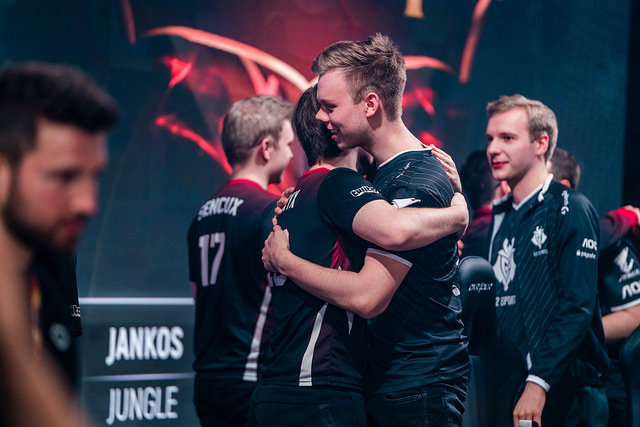 There were a couple of unexpected upsets last week, but other than that it was yet another “day at the office” for the EU LCS teams. Splyce vs. Giants Gaming – This is a very interesting match-up, but perhaps for all the wrong reasons. Splyce were able to outclass Fnatic last week on all fronts, however when it came to repeating that level of play they were completely lost. It’s a strange time to be a Splyce fan for sure. On one hand, they displayed incredible teamwork and individual skill against Fnatic, but on the other it’s a bit like a flash in the pan. They were so fast on the map, so agile and fast to react. They dictated the tempo and started dominating from the very get-to, however the very next day – against an opponent that was deemed far less capable than Fnatic, Splyce were lost. They were passive, and after they made just a couple of bad calls in the early game they completely froze. Schalke was able to dance around Splyce and almost get a perfect game. Giants on the other hand got perhaps the biggest upset of the split, as they were able to take down G2 eSports. It was a strange game for sure – Giants were able to be the aggressor early on, and they went blow-for-blow with one of the best teams in the region. Even though G2 took control in the mid game, Giants were able to capitalize on their mistakes and punish – hard. Within just a couple of minutes, they took out Perkz (who was horrendously out of position), took Baron, aced G2 and ended the game. It wasn’t exactly a showcase of excellence, but they did get the win, and they did make the right plays at the right time. This week will be a true test for Splyce, and whether or not they’ll be able to contest for a playoff spot essentially hinges around their performance against Vitality. For this match however, they should be favored, but it’s best if you just skip betting on this match altogether, as if they don’t get the picture-perfect start they probably won’t be able to bounce back in the late game. Schalke 04 vs. H2K – For our second match of the day, we have a pretty unexciting clash between Schalke and the only team that is still winless in the region. Speaking of H2K, they did at least show some signs of life against the Unicorns of Love. Nothing too sensational, but at least it was an improvement over the first three weeks of competitive play. While no one really excelled… at anything, they at least went even for the majority of the game. They failed to keep up in the macro department, which is why they ultimately lost but at least they did something right. With Sheriff back on traditional late game AD carries, H2K might have a chance going forward. Unfortunately, that chance isn’t coming against Schalke. As for Schalke, they were finally able to end a week 2-0 which is quite a big achievement considering just how inconsistent they were overall. They were incredibly proactive against Splyce and they suffocated them from the very get-go. Nukeduck on Aatrox was perhaps the biggest star, as he was able to assist his sidelanes more often than not. It was a “by the book” type of game – get a lead early, snowball through sidelanes, secure objectives and eventually with a big enough gold lead out-teamfight the opposing team. After thirty incredibly clean minutes of gameplay, Schalke had a fifteen thousand gold lead – insurmountable for even the best teams in the region, let alone an inconsistent one like Splyce. That said, it’s hard giving them all the praise because they just did what they could – Splyce didn’t do anything, and against such a passive opponent, it’s not hard to look good. Regardless, they should be more than able to take down H2K in relatively quick fashion. ROCCAT vs. Misfits – Last week was yet another incredible showing from Misfits, who’ve now solidified their spot as the absolute best team in the region. While they did make some mistakes against Vitality, they persevered and eventually closed things out in spectacular fashion. They’re currently 8W-0L and they show no signs of stopping. This time around, they have a somewhat easier match on Friday. ROCCAT have the tools to make this into a very competitive scrap – especially if they start off on the right foot. They didn’t look that good against Fnatic though, they were focusing more on getting kills whereas Fnatic focused on objectives. As a result, they were painfully out-scaled. Fnatic had six turrets to zero by twenty minutes, all three drakes as well as insane damage output. It wasn’t exactly a good performance from ROCCAT, but they didn’t lose too much stock. With a fed Memento, they can go toe-to-toe with any team in the region (at least for a bit), but Misfits should be able to emerge victorious regardless. Unicorns of Love vs. Fnatic – For our fourth game of the day, we have a clash between Fnatic and the Unicorns of Love. The Unicorns are still trying to find their own unique playstyle and depending on the week, they might look relatively solid or downright lost. They have a solid read on the meta but they’re far too inconsistent, and that hurts their chances of challenging for Top 6. They’re currently sitting somewhat comfortably (much better than last split) with three wins and five losses, but they have an incredibly hard schedule this time around so their record probably won’t look as acceptable as it does right now when the week’s over. Their win against H2K was a solid one, but they didn’t really look as dominant as you’d expect against a team of H2K’s caliber. To be fair, they didn’t have Samux so that could have left a dent in their overall synergy and shotcalling. Fnatic, on the other hand, want some serious redemption after getting outclassed by Splyce last week. They’re still a top tier team even with that loss on their record, but they need to find a way to play at a high level more consistently. It seems like they’re still experimenting a bit too much, and with Rekkles still waiting on the sidelines there are so many questions waiting to be answered. Fortunately, with the upcoming buffs to crit-based AD carries, we’ll get to see the Swedish MVP back in action sooner rather than later. As for this match-up specifically, Fnatic should have the edge on almost all fronts. That said, the Unicorns have the tools to make this somewhat close, especially if Kold imposes his playstyle and starts off strong. G2 eSports vs. Team Vitality – This is where things get very interesting. Much like last week, the last match of the day is an absolute must watch. G2 had a slight fall from grace last week as they were handed not one but two losses back-to-back. While their loss to Misfits is somewhat forgivable – especially seeing how it was a tight affair from start to finish – their loss to Giants isn’t. They showed weaknesses and dents in their armor, but they’re still a top tier team. However, with the meta shifting a bit towards standard AD carry play, they’re going to lose a bit of their potency. Hjarnan will still be able to go for mages in the bottom lane but it’ll be a lot less effective. As for Vitality, they’re currently sharing the third spot in the rankings with Fnatic. They’re looking fairly strong overall, and their close game against Misfits really shows what they’re capable off if they impose their own playstyle from the very get-go. It was a close back-and-forth game, with Vitality fighting tooth-and-nail for every single objective. They didn’t make a lot of mistakes overall but they weren’t on the same page when it came to teamfighting and that essentially cost them the game. This is a hard match to predict for sure, especially after witnessing G2’s form last week. The only question is – which G2 will show up? With a week to recuperate from Rift Rivals, they’ll surely want some redemption for their 0W-2L showing last week. we’re going with G2 eSports on this one. They didn’t lose a lot of stock last week, especially considering the fact that they were ahead in both of their losses. The mistakes that they made are fairly easy to correct in a week’s time, so they should have the edge against Vitality. Schalke 04 vs. Unicorns of Love – For our first match of the day we have a fairly interesting clash between two middle-of-the-pack teams. Now while Schalke are favored (with good reason) and while they have displayed better team synergy and higher individual level of play, they’re far from a consistent team. They’re showing a lot of potential overall – if things go their way. Their win against H2K yesterday wasn’t pretty – at all. In fact, they were on the back foot for the entire game. To their credit, they did try to minimize their losses, they did have surges of proactivity and aggressiveness, but they weren’t as frequent as they should have been. It was a strange sight, seeing this 0W-8L team dictate the tempo against a 4W-4L team that many have in the Top 6. In that sense, this was far from a good performance. That said, after Vizicsacsi’s incredible Poppy ultimate, Schalke were able to seal the deal and close out the game. The Unicorns on the other hand failed to put up much of a fight against a game Fnatic. They were demolished from the very get-go, and with Caps going legendary before the twenty minute mark, there was only so much that they could do. It was one of those games when nothing went right for the Unicorns, and to top of it all, Exileh echoed flashbacks of his abysmal 2017 seasonn. We’re going with Schalke on this one, but the Unicorns might be able to make it a lot more competitive than people expect. H2K vs. Giants – The second match of the day is perhaps even less engaging than the first one. That said, both teams have a knack for sloppy teamfighting so we might be in store for some exciting Summoner’s Rift bloodshed. However, without any solid macro on either side, this could sway into the fiesta side of things fairly quickly. Giants lost a very close game against Splyce yesterday. They were ahead for a good portion of the game, they did the right plays, made the right moves, but when it came time for some creativity and proactiveness – they were nowhere to be found. They all played very well on an individual level but it wasn’t enough. Splyce found a way to prolong until the late game (longest game of the split so far), and it paid off. Whenever Giants had the lead they never took a step forward which eventually cost them the game. H2K on the other hand went blow-for-blow with Schalke for almost the entire game, which was quite surprising. However, the very first moment they made a bad call, they were punished for it and the game was over. Overall they showed improvements in all facets of play, so betting against H2K will get increasingly harder. That said, without a win on the board, it’s impossible to give them any benefit of the doubt, especially after witnessing Giants take down the former kings of Europe last week, and nearly winning against Splyce. Splyce vs. Team Vitality – This is where things get a lot more interesting. Two teams with completely different playstyles, but both pretty strong depending on how well they start off. Vitality are in a somewhat better position when it comes to the standings, and they’ve displayed a lot more consistency over the last couple of weeks. Furthermore, these two teams already fought in week one – as a part of the Spring Split third place rematch, and Vitality got the win. This is a tricky match to predict. Splyce probably won’t start off as well as they want to, so they’ll prolong until the late game, but Vitality on the other hand has the proactive, aggressive playstyle so they’ll push the tempo whenever they see fit. We’re going with Vitality on this one, but Splyce have the tools to make this into a very competitive (and long) game, especially if Xerxe comes online. Misfits vs. Fnatic – Match of the week, without a doubt. This is a clash between two of the best teams in the region, and it’ll be filled with fireworks for sure. It’s still hard to fairly gauge Fnatic’s strength right now. They looked fantastic against bottom and mid tier teams, but when it came to facing stiffer opposition they fumbled. It’s still strange seeing Bwipo in the bottom lane and even though they’re making it work more often than not, they’re not as strong nor as potent with him in the line-up when compared to Rekkles. On the other hand, Misfits looked incredible over all five weeks of competitive play, they’re yet to lose and they show no signs of stopping. If there is one team that’s currently favored to win Summer Split it has to be Misfits. We’ve yet to see them play a Best of 5 in the current meta, but they’re so incredibly sound in every facet of the game that’s it’s impossible not to give them the benefit of the doubt – regardless of the opponent. ROCCAT vs. G2 eSports – To close out the fifth week of competitive play, we have a pretty fun match-up between the former kings of Europe and ROCCAT. Speaking of ROCCAT, they were unable to impose their own playstyle against Misfits yesterday, as the best team in the region was always one step ahead. For a good portion of the game, it was a masterclass in macro and stellar teamplay from Misfits, however they did make more than a couple of mistakes in the mid game which allowed ROCCAT to make it somewhat close. However it’s hard seeing them do the same against G2 eSports. The former kings of Europe are fresh off of a strong showing against Team Vitality and they’re looking to further cement their position as the second team in the standings. They want to continue playing at this level and eventually take hold of the second seed playoff bye. They need every win they can get, and beating ROCCAT is almost a certainty.